Palos Verdes families’ photos, documents sought. Library volunteer Richard Kawasaki discusses his family history. The doll in the glass case was made by his mother, Josephine Sachiko Ashimoto, whose family farmed on the Palos Verdes Peninsula before World War II. ROLLING HILLS ESTATES — Those with ties to the Palos Verdes Peninsula are invited to participate in “Your Story Is the Peninsula’s Story,” a project of the Palos Verdes Library District’s Local History Center. The events are free and open to the public, and registration is not required. The project is supported by a grant from the Institute of Museum and Library Services. 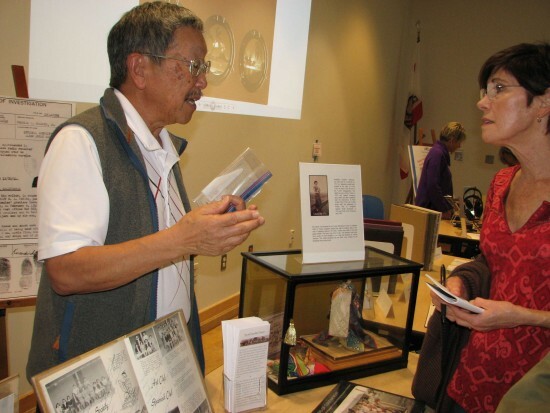 A kickoff event on Jan. 16 at Peninsula Center Library included a section devoted to the 40 Families Project, which documents the stories of Japanese immigrants who farmed on the Peninsula for decades until their forced departure in 1942 due to Executive Order 9066. They were renowned for such crops as garbanzo beans, tomatoes, strawberries and flowers. The project was launched in 2003 by reference librarian Marjeanne Blinn, inspired by a panoramic group photo taken on Nov. 24, 1923 at the completion of the Agricultural Society Hall at San Pedro Harbor. With the hills of Palos Verdes as a backdrop, the building was to house classes in Japanese language and judo, meetings and social events. The initial goal was to identify the 187 people in the photo, all dressed in their “Sunday best” and ranging in age from infants to seniors, but the project expanded to cover the stories of each identified family. Those who were children in the photo, and descendants of the others, were interviewed. Records were obtained from the Census Bureau and the National Archives, including “alien registration files” listing each Issei’s birthplace, date and place of entry into the U.S., work history, and internment experience. Microfilm for the 10 War Relocation Authority camps lists family members and where they went after their release. The collection includes renderings by interned artists and letters from interned children to Malaga Cove teacher Afton Dill Nance. Among the items on display at the kickoff event were a 1910 document leasing Kumekichi Ishibashi, one of the people in the photo, and two other Issei farmers; a booking record detailing the FBI’s arrest of Ishibashi in 1942 for allegedly possessing a short-wave radio receiver and a camera; and high school yearbooks (El Chaparral) from the Poston 2 camp in Arizona. The Ishibashis continued to farm in the area after the war and sold produce at Annie’s Stand, named for the wife of James Ishibashi, a son of Kumekichi’s brother Tomizo, near Torrance Municipal Airport. James Ishibashi died in 2002 and his Portuguese Bend home and farm were sold in 2011. His brother Tom died in May 2011 and the family farm closed in March 2012. 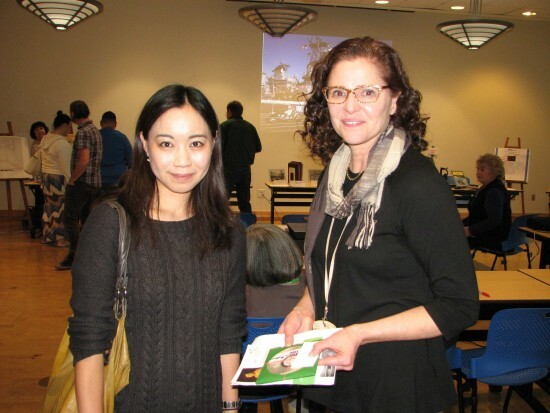 Monique Sugimoto (right), archivist and local history librarian, and Yuka Mima Schattner, a teacher at Nishiyamato Academy of California. Richard Kawasaki, library volunteer and retired Lomita city planner, displayed a Japanese doll made by his late mother and a photo taken of her at Lunada Bay in 1931. Born Josephine Sachiko Ashimoto, she was delivered by a midwife in 1913 at a Little Tokyo hotel located at the current site of LAPD headquarters. Her family moved to Palos Verdes in 1929 and farmed tomatoes, peas, beans and other vegetables near the intersection of Palos Verdes Drive West and Tyburn Road until the war broke out. She married Frank Kawasaki in 1931 and lived in San Francisco until 1942. While interned at the Topaz camp in Utah, where most Bay Area residents were sent, his mother learned the craft of making dolls in the style of Japanese dancers. The bodies were made of wire and papier-mache. The faces were done in ink. The kimonos were sewn from scraps of cloth, and the small platforms for the dolls were crafted from scrap wood by the husbands. “One of the neighbors in camp was, I think, a professional dollmaker. She had the parts and the expertise to teach people,” Kawasaki said, pointing to a drawing of about a dozen women learning how to make dolls. Detail of the 1923 panoramic photo that inspired the 40 Families Project. He added, “I don’t know the history of this doll, but I know the history of the two that were in the traveling exhibit. They were famous kabuki characters. I have another one at home that is not in as good shape as this. Among those attending the kickoff event was Yuka Mima Schattner, who teaches students at Nishiyamato Academy of California, a private school in Lomita for children of Japanese expatriates based in the South Bay. Although the curriculum matches that of schools in Japan, since the students will eventually go back to Japan with their families, she also takes her students to the library to learn about Japanese American history, a subject not widely known in Japan. The Local History Center is located in the Peninsula Center Library and is open Monday through Thursday from 10 a.m. to 4 p.m., Friday from 1 to 4 p.m., Saturday from 10 a.m. to 1 p.m., and by appointment. For more information, call (310) 377-9584, ext. 291.